Update: The morning after Donald Trump accepted the nomination of the Republican party, he for some inexplicable reason decided to defend his past reference to Ted Cruz's father having been somehow connected to Lee Harvey Oswald. Trump suggested that the thoroughly unproven link might still exist, so we're republishing this article from May to explain what's going on. If we can. The National Enquirer used information from a photo-scanning company that indicated that Cruz's father, Rafael, was the man helping Oswald pass out fliers supporting Fidel Castro three months before Kennedy's assassination. So, naturally, that went on the cover. How does this odd thing crop up in 2016? Thanks to one of the many unsolved questions left over 50 years later from the president's assassination — one of the most thoroughly investigated crimes (by both professionals and amateurs) in history. Cruz got looped in for two reasons. The first is that his involvement is theoretically possible. In 1961, Ted Cruz's father graduated from the University of Texas in Austin. At some point (it's not clear when), he moved to New Orleans. He was living there by 1967, when he registered with the Selective Service. It's not clear if he lived there in 1963, when he was 24, but New Orleans is only about seven hours from Austin. The second is that the man in the photo has never actually been identified. Gerald Posner's "Case Closed" attempts to dismantle all of the various theories that emerged from the Kennedy assassination. In the middle, in the traditional clutch of glossy photos that appear in such books, he has a larger version of the photo the Enquirer used on its cover. The picture comes from an incident during which Oswald and two other men passed out leaflets on behalf of the "Fair Play for Cuba Committee" — a national organization for which Oswald presented himself as the New Orleans branch. The official report on the assassination (that is, the Warren Commission report) indicates that there is no evidence that anyone besides Oswald could be identified as a member. So where did the two men come from? Note the caption. "He hired two men from the unemployment line to help him distribute the pamphlets." That account comes from the Warren Commission's research. The two men were apparently approached by Oswald at the Louisiana State Employment Commission and offered a few dollars if they'd help pass out pamphlets. That's the assumption, anyway; the only testimony on the record is from a young man named Charles Steele, who spoke to Warren Commission lawyers in April 1964. Steele indicates that he was there because he'd driven a friend to the building to take a test she needed to pass in order to get a job. Oswald came up, offered him $2 for 20 minutes of work, and Steele agreed. He dropped off his friend after her test and met Oswald at the New Orleans Trade Mart building. He can be seen in this video, passing out leaflets alongside Oswald. Steele, no tie, passing out fliers with Oswald. The lawyer interviewing Steele, Albert Jenner, spent some time trying to figure out who he might be. Steele (who says he's 20, not 16 as in the final report) arrived at the Trade Mart before Oswald and the third man, who came together. Mr. JENNER. This man that came along with Oswald, have you ever seen him since then? Mr. JENNER. Had you ever seen him before that time? Mr. STEELE. No; I never did. Mr. JENNER. Was there any conversation between Oswald and the man he brought along with him that you might have overheard? Mr. JENNER. What was your impression of the connection between them, if any? Mr. STEELE. The same as mine. He was getting them out of this unemployment place, just like he did me. Steele is asked what the third man looked like. Mr. JENNER. What did he look like, this man who was there also passing out leaflets? Mr. STEELE. Well, I shouldn't say this, I guess, but he was sort of Cuban looking, like that. Mr. JENNER. Olive skinned, do you mean? Mr. STEELE. Yes; olive skinned, but he was back in the rear, passing out leaflets, and I never did even see him. By "in the rear," Steele seems to mean that the third man was not out on the sidewalk, in the way that he and Oswald were. Mr. JENNER. Describe this man who came along with Oswald. Mr. STEELE. Right now I haven't the slightest idea what he looked like. I think, as I recall, he was about Oswald's height. Mr. JENNER. Oswald was 5 foot 9. You say he was the same height, or taller, or what? Mr. STEELE. Well, he wasn't shorter. He was either the same height or slightly taller. Mr. JENNER. Would it refresh your recollection if I told you that when you were interviewed by special agents of the Federal Bureau of Investigation on the 24th of November, 1963, that you told them that he was aged 19 or 20 years, that he was about 6 feet tall, slender built, dark hair, and olive complexion? 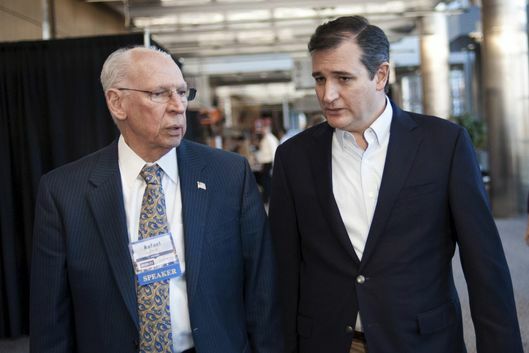 It's not clear how tall Rafael Cruz was at the time, but in current photos he appears to be slightly shorter than his son. Ted Cruz is about 5-foot-10. Steele tells Jenner that he stopped handing out the fliers once news cameras showed up. He insists that he didn't actually read the fliers; he was just in it for his $2. (Which he got.) So perhaps the third man didn't read the fliers either. If he had, though, and if he was Rafael Cruz, it is very unlikely that he would have stuck around to pass out fliers supportive of Fidel Castro. While Cruz was at one time sympathetic to Castro, that had changed by 1963. The New Yorker's Ryan Lizza told that story in 2012. When Castro came to power in 1959, the elder Cruz quickly grew disillusioned. His younger sister fought in the counter-revolution and was tortured by the new regime. Rafael returned to Cuba in 1960 to see his family, and was shaken by what Castro’s Communist dictatorship had wrought. “When my father got back to Austin,” Cruz said, “he sat down and made a list of every place he’d gone to speak, and he made a point of going back to each of them and standing in front of them and saying, ‘I owe you an apology. I misled you. I took your money and I sent it to evil ends.’ And he said, ‘I didn’t do so knowingly, but I did so nonetheless, and for that I’m truly sorry.’ "
We're asked to believe, then, that Oswald ran into a Rafael Cruz at an employment office in a city where Cruz may not have been living. That Cruz then agreed to join Oswald in passing out fliers, despite their advocating a position that Cruz himself vehemently opposed. That he may or may not have been photographed doing so —and that a witness at the scene thought the other guy passing out fliers was a lot taller than Cruz. A huge number of chips would have had to fall into place for this to affect the 2016 presidential race. It's much more likely that some guy looking for a job in New Orleans in August 1963 was offered $2 and took it —just like Charles Steele. Unless someone admits to being that man, though, we'll probably never know. They tried to solve this mystery six months after the fact, without luck. Doing so 50 years later seems less likely to be successful.